To ship a car is one of the most troublesome parts of overlanding – I think most overlanders will agree on this. But, since there is more water than land on this planet and you do want to see more than one continent, well, what can you do? You ship your car. But how? Here are some basic issues with regard to shipping. Note that our personal experience is limited to container shipment. Info on RoRo shipping is what I gathered from other travelers. Container shipment. 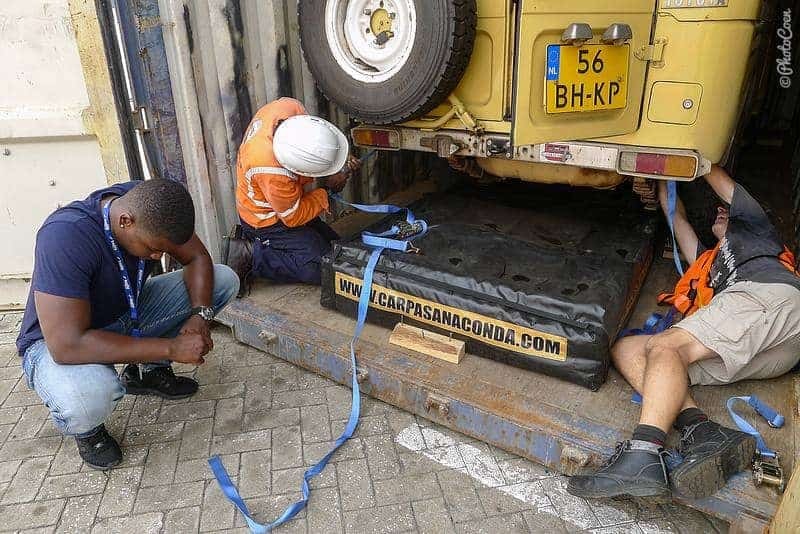 With a container shipment your vehicle is transported in a locked and sealed, metal container, which minimizes the chances of it being damaged or broken into. RoRo shipping, or Roll on Roll off, which means your vehicle is transported on a cargo boat. Most containers measure 20ft or 40ft. Both are suited to ship regular cars. The height and width of a 20ft and 40ft container are the same. A regular car fits into a 20ft container but you will probably save money by sharing a 40ft container. A hi-cube container has the size of a 40ft container but a higher roof. The advantage is that the container is sealed and thus secure; the disadvantage is the high costs. An open-top container has the same measurements as a 20ft container but has no roof. There is reasonable protection against damage, but the top is open and the vehicle is vulnerable to burglary. A flat track is suited for a vehicle that is wider than a 20ft container as it is open on all sides. Disadvantages are the high price, vulnerability to damage and burglary, and corrosion from salt water. Lashing the Land Cruiser and the rooftop tent. How Does RoRo Shipping Work? You, or an employee, drives the vehicle onto a ferry-styled cargo boat and will be secured by a number of straps and braces. Depending on the situation and the RoRo shipping company, you drive your own vehicle onto the ship or hands over your keys to the shipping liner. When both RoRo vessels and container liners ply the same route, RoRo shipping is often the cheapest way to ship a car. It has less bureaucratic hassle than a container shipment as in most cases a RoRo shipping rate includes all paperwork, whereas in the case of a container shipment the owner has to clear his vehicle at the port of destination. You drive your car onto the ship and fly to your destination where you’ll pick up your vehicle. The advantage is not having to sit on a ship for four weeks. 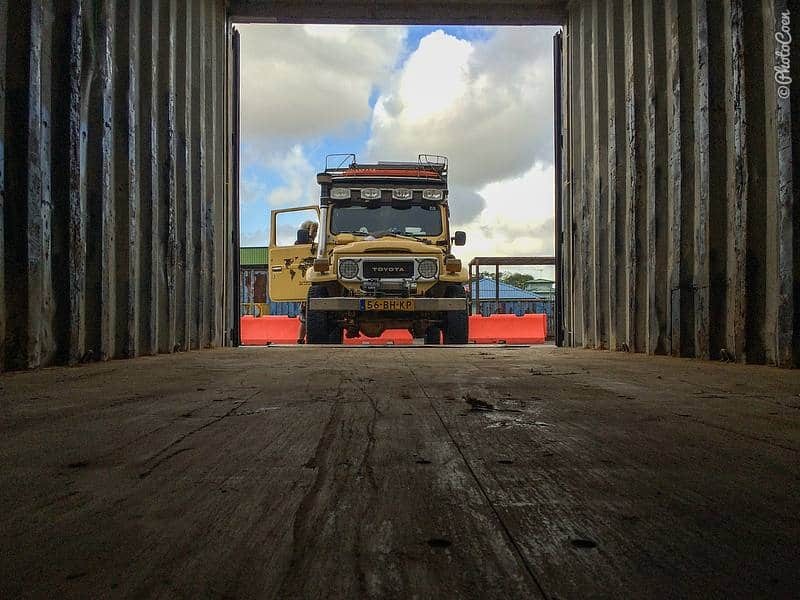 The disadvantage is that Grimaldi will probably stop at several ports along the way for loading and unloading, where experience has taught overlanders to stay near their vehicle to avoid burglary and damage. Not being present leaves your car vulnerable in these ports. You drive the car onto the ship and accompany it during the four-week shipment South America. You will pay an all-inclusive price for the vehicle (which depends on size/weight) and an all-inclusive price for board and lodging. On the Central American side, the most common ports to ship a car from are Panama and Costa Rica. On the South American side, overlanders mostly choose between Colombia or Ecuador. This choice is a result of personal preference, political stability – or instability – in these countries as well as the availability of shipping liners. How was your shipping experience? Feel free share in the comment section below! 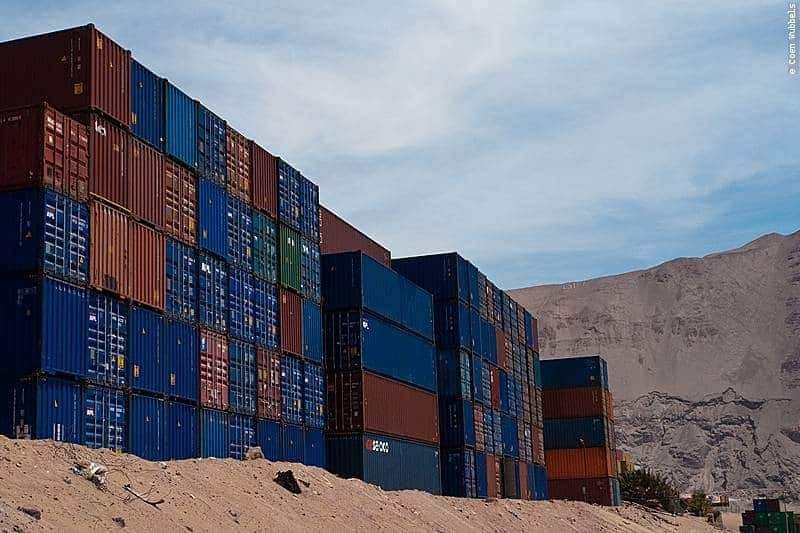 Temporary Import Document for South America – What Is It? Do You Need It? Hi there! I would like to know if you had the experience of shipping a normal car from Europe to South America. If yes, which are the best countries in both sides to do the connection? And how much in average it will cost? Or compensates more to buy a car while in South America, for example? Thanks a lot! Enjoy your trips around the world! Hi Ana, we didn’t ship from Europe but Malaysia. To read more about which ports to go to or to avoid, check out this article. http://www.landcruisingadventure.com/shipping-ports-in-south-america/. Below that article you’ll find a whole list of other links with more info on shipping, among which what to pay attention to when negotiating a fee. Our last shipment was in 2007 so I have no idea about costs anymore. A lot depends on season, the agency, your negotiation skills. Depending on how long you want to stay in South America, it’s worth shipping your vehicle or buying on here (best to be done in Chile, find more here: http://www.whereswaller.com/#!2015-buy-a-car-in-chile/c1kma). The longer the trip, the more worth bringing your own, I’d say. Grimaldi bietet momentan Sonderangebote für die Rückreise von Montevideo nach Europa! Hi there! I would like to know if you had the experience of shipping a normal car from California to South America and how much in average it will cost?. Thanks a lot! No we haven’t, you could ask on groups on Facebook such as OverlandSphere and PanAmerican Travelers Association. how much in average it will cost..
Hi Marc, as written in the article we have shipped our trusty Land Cruiser in a 20ft container. We have no experience in shipping a 42ft motor boat. But I am certain you can. You can ship almost anything. Contact your nearest CMA-CGM or Maersk agent and ask them to help you handle it. But beware of shipping things into Brazil as we are told mostly by Brazilians about the difficulties with the customs in getting around the red tape. Good luck and keep us posted on your motor boat. We don’t have any contact, as you maybe have read, we did everything ourselves. Do you speak Spanish? Mijn vriend en ik beginnen dit voorjaar aan ons nomaden leven in een omgebouwde vrachtwagen. Wij willen tzt overvaren van Europa naar Zuid Amerika. Weten jullie of je op zo”n boot je hond mee kan nemen ? Veel plezier op jullie reis. Wanneer gaan jullie weg? Misschien nog tijd om op de overlanders reunie te komen, in mei? Hi, I am looking at shipping a van or similar from the UK to South America (preferably Chile or Argentina) and then driving all the way to Alaska. I know there are certain rules about imported cars in different countries, but not sure what paperwork / licences I would need to take a UK imported ship from South America to Alaska, do you have any advice on this please? Hi there, i would like to ship the car the other way around, from Peru to Europe. I live in the Netherlands. Would you have any recommendations for the shipping and know a company which can offer this service? Hello Franciska, will it fit in a container? Try to contact the bigger shipping liners. I intent to move to Santiago Chile South America and I want to take my Audi with some furniture…..how much will be aprox….if you can tell me please. Hi Ricardo, if you’re going to live there, you’ll have to import your vehicle. That’s a whole different ball game that taking a vehicle across the ocean for travel and get a Temporary Import Document. I can’t help you with this, sorry. Check out the major shipping lines on Internet (Maersk, CMA CGM, etc), and ask them for a quote. Best of luck and enjoy Chile!. Yes, we shipped from Bangladesh to Singapore, from Malaysia to Argentina and from Suriname to South Korea using a container. Do you by any chance remenber the constact details of the clearing agent you used in Argentina and South Korea. Tough finding someone to trust.